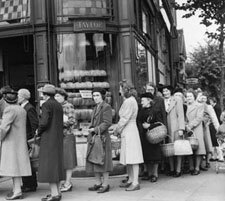 The eagerly awaited Brighouse 1940s Weekend takes you back to the 40s and lets relive the community spirit, music, fashions and dancing that were popular at that time. 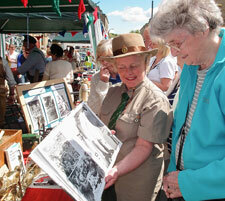 Come and see what life was like in this significant time in our history as the town centre and shops are transformed. You’ll be able to sit in a Messerschmitt, see Churchill, learn to dance the Lindy Hop or dance the night away with the Ashby Big Band. This is just a flavour of the wonderful events taking place over this family fun weekend. 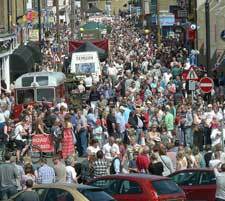 The whole town centre will become the venue for a host of 1940’s events and displays from Spitfires to vintage vehicles, from home cooking to 1940’s dress and make up. 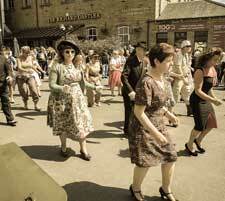 Why not join in the fun and come dressed in 40’s style and help bring a real period feel to the town. NOTE: SS Uniforms and Insignia are not permitted at our event and anyone wearing them will be asked to leave.